There was James Bonwick with his tour through the Western District in 1857, colonial artists such as Eugene von Guerard and Samuel Gill and there was poet Adam Lindsay Gordon. From each of these sources we can learn about Western District life during the 19th century, its natural features, who the people where and how they lived. Bonwick’s book Western Victoria, Its’ Geography, Geology, and Social Condition: the narrative of an educational tour in 1857 gives a wonderful insight into the small towns of the Western District, the people he met along the way and the flora, fauna and topography of the land. A town that received a positive report often had residents with church habits that met Bonwick’s approval. The colonial artists captured the natural landscape, homesteads of squatters and life on the diggings. Von Guerard’s “Old Ballarat as it was in the summer of 1853-4” is recognised as an accurate depiction of the Ballarat diggings. If you visit the Art Gallery of Ballarat, allow time to be mesmerised by the original and it’s detail. Adam Lindsay Gordon in lyrical verse described the rugged limestone coast of the south-east of South Australia, the sea, the bush and colonial horse racing. 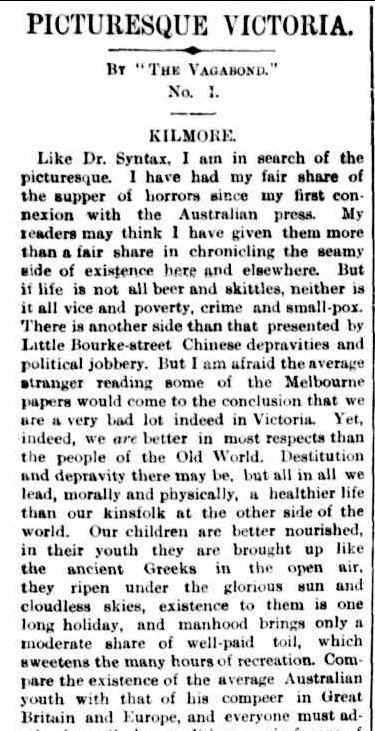 Then there was The Vagabond, a newspaper journalist who trekked throughout Victoria in 1884 and brought readers of “The Argus“, and beyond, a picture of country Victoria through his eyes in the series “Picturesque Victoria“. Over the next few months, I hope to share the “Picturesque Victoria” articles that relate to Western Victoria as they give us a glimpse of the social history of the district. Looking at The Vagabond’s life I thought it right to tell you something about him ahead of those articles as I believe that knowing something of the man enhances the reading experience. Some you may know of The Vagabond and his tour through Western Victoria, but do you really know the him? The Vagabond was the pen name of John Stanley James, alias Julian Thomas. John Stanley James was born in Staffordshire , England in 1844. In 1872, he left England for America, changing his name to Julian Thomas. 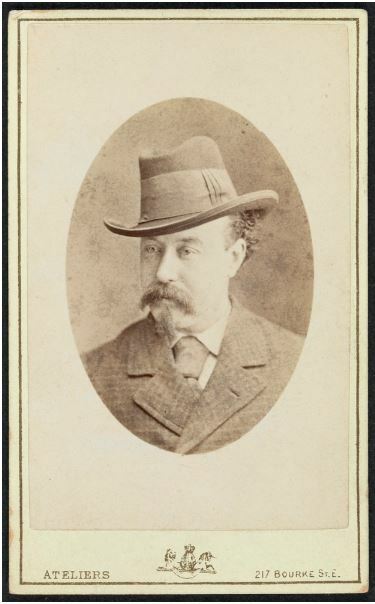 After a failed marriage in Virginia he travelled to Sydney in 1875, then began work at Melbourne’s Argus newspaper as a journalist, a profession he had tried to break into in London during the late 1860s. James immersed himself into his subjects, taking investigative journalism to the extreme. 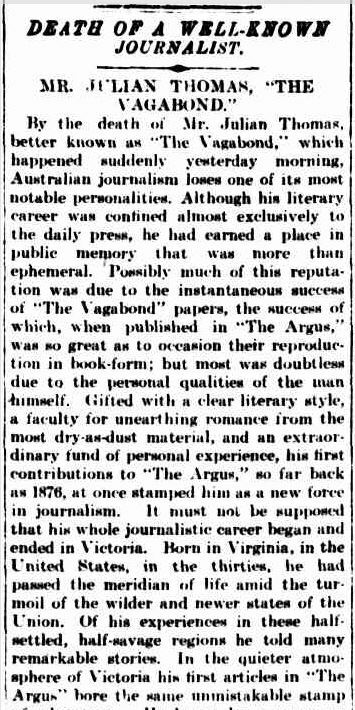 In 1876, he began a series of articles for The Argus, later compiled and published as the “The Vagabond Papers“. By August 1877, there were three series of “The Vagabond Papers” in publication, with 15,000 copies sold in the colony and also republished in Germany. The premise behind his articles was to take readers into some of Victoria’s institutions and give an often “behind the scenes” insight. 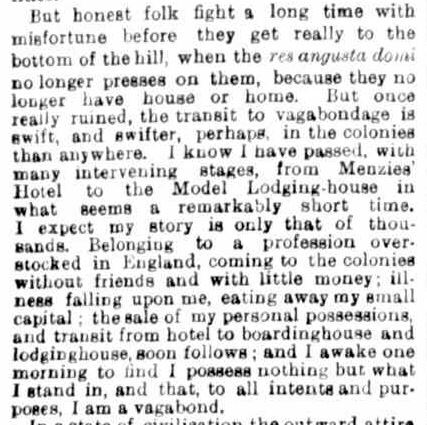 The first article written was “A Night in a Model Lodging-House” on April 15, 1876 and James, then known as Julian Thomas introduced The Vagabond. 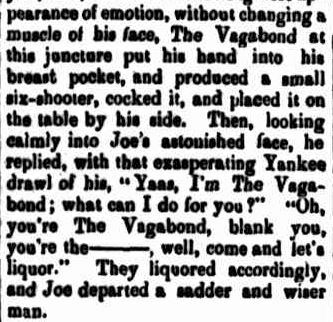 The article continues with a vivid description of The Vagabond’s first night in a lodging house. Two weeks later he published “A Day in the Immigrant’s Home”, followed by titles such as “In a Fashionable Church”. “Three Days in the Benevolent Asylum No 1.” showed the lengths James would go to for a story. He managed to have himself admitted to the Melbourne Benevolent Asylum and spent three days living the life of an inmate. 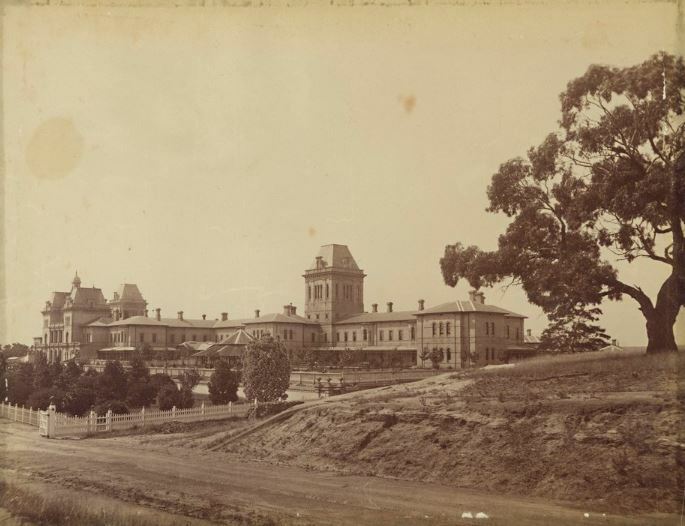 Three days in the Benevolent Asylum was nothing when James spent a month in Kew Lunatic Asylum writing the series “A month in Kew Asylum and Yarra Bend”, although as a staff member and not an inmate. My own favourite is “Morning at Flemington“. The Vagabond arose early and made his way to the Flemington racetrack to watch trackwork and observe the characters that abounded there. It was his beautiful description of the city at an early hour that really had me feeling as though I was there walking through the Fitzroy Gardens. Some of the The Vagabond’s other adventures included “Three Weeks in the Alfred Hospital“, “A Month in Pentridge” and “At a Bazaar”. The following article from the Warwick Examiner and Times, August 18, 1877 describes a meeting between a notorious bookmaker and The Vagabond with the adage”The pen is mightier than the sword” put to the test. An interesting point of this article is the line “...he replied, with that exasperating Yankee drawl of his…”. Yes, after two years in America, John James had picked up an accent, presumably with a hint of the south given his time in Virginia. I do think it may have been more by design than an accident. 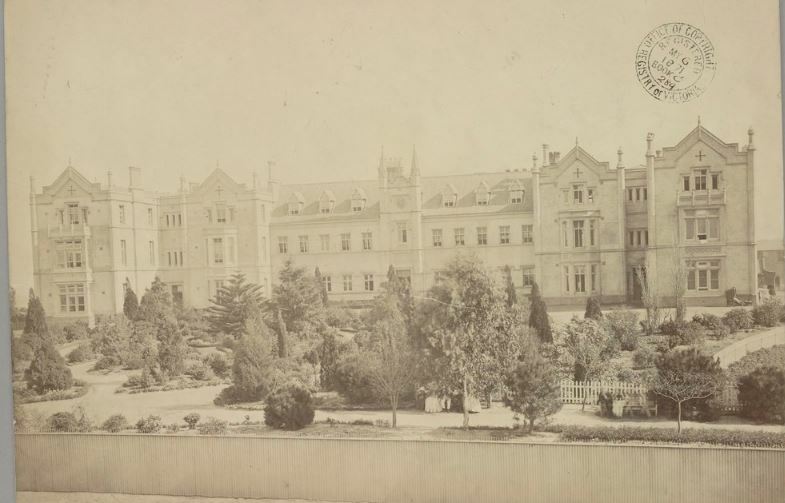 In 1877, James went to Sydney to write for the Sydney Morning Herald and then on to New Zealand, New Caledonia, New Guinea and Fiji writing on his experiences. Some of those were compiled into a book called Cannibals and Convicts. Say no more. He then went further afield writing travel articles for The Argus from China, Japan, Canada and the United States. 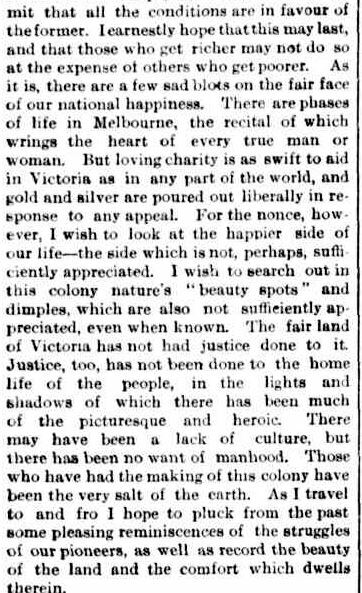 By 1884, The Vagabond was back in Melbourne ready to set off on a tour of Victoria to produce a series of articles entitled “Picturesque Victoria“. 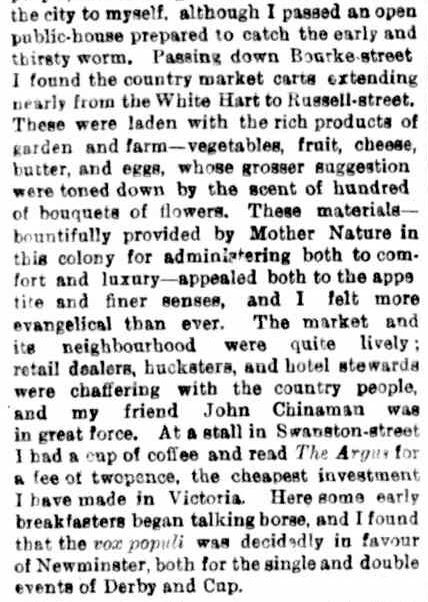 The first article was “Picturesque Victoria No.1 – Kilmore”. Giving the reasons behind his journey, he bid adieu to his responsibilities, including the Shakespeare Society, and with his Australian Handbook in his pocket, he departed Spencer Street Station passing then through the suburbs, by the docks, the factories and the Melbourne Benevolent Society, bound for Kilmore . 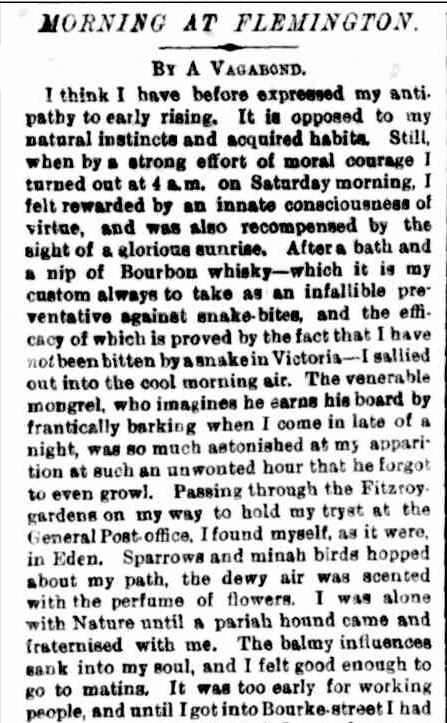 As The Vagabond’s tour around Victoria gained momentum, residents of small towns anticipated a possible visit so he could write a glowing report. Those towns that he did visit turned out to greet his arrival, celebrating with dinners and gatherings, an extra sweetener . 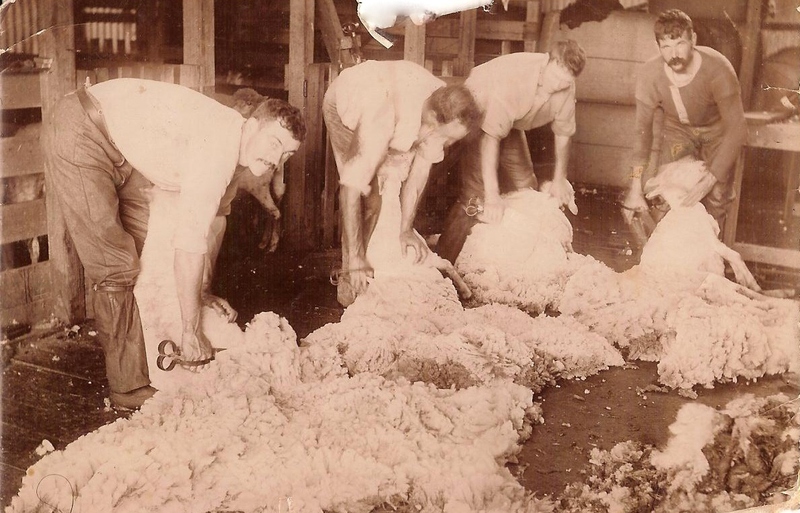 After the tour of Victoria, James went to the Pacific again, visiting Samoa and Tonga. From 1890-1892 he was the Victorian Royal Commission on Charities. In 1896, he died in what his biographer John Barnes describes as “squalor” in his Fitzroy flat. The only person that truly knew the Vagabond was John Stanley James himself. Everyone knew him but no-one really knew him. Even his own employer, The Argus, possibly fooled by his “Yankee drawl”, fell into the trap of believing his tales of the past. This is no more obvious than his obituary. They reported James was born in Virginia, United States, while The Age, closer to the truth, reported him as a native of Wales. James was born in Staffordshire and maybe if those at The Argus had access to the marvels of today’s technology, they may have found the Warwickshire birth record of John Stanley James. Also his 1851 Census record. as a six-year-old living in Warwickshire with his attorney father Joseph, mother Elizabeth and two siblings. Or the 1861 England Census when he was living with relatives in Liverpool and working in the family foundry, Or even the 1871 England Census when John James was back in Warwickshire living with his mother and spinster sisters,himself then 26 with no known occupation. John Barnes wrote that the true identity of The Vagabond aka Julian Thomas was not known until 1912. The true identity being his name “John Stanley James” although his birth place is still confused. He created an enigmatic persona with such skill that he was able to keep up the facade to the grave and beyond. Long after his death may his literary skill be also celebrated. This entry was posted in Western District History and tagged John Stanley James, Julian Thomas, Picturesque Victoria, The Vagabond. Bookmark the permalink. Superb post Merron! A pertinent reminder of how wide we should spread our research net. Will be showing Mr Cassmob the photo of the asylum where his ancestor died. Thank you Pauline. Those asylum buildings were imposing and the Vagabond was brave to go inside, even as a staff member. Sorry to hear about Mr Cassmob’s ancestor, such a sad way to finish life. Merron. Bonwick, Guerard, Gordon and Gill were eternal Guests, never having to return the hospitality. I would like to roam about the WD guesting at all the big bluestones, oh yes. I did stay at Arrandoovong once as a paying guest on my first genealogical exploration. It was beautiful. even the chooks pen had roses all over it. What a great subject – someone so well known but so unknown! Thank you Susie. I do find him intriguing. I like enigmatic characters with Adam Lindsay Gordon another of my favourites. I really must continue writing of The Vagabond’s through the Western District.